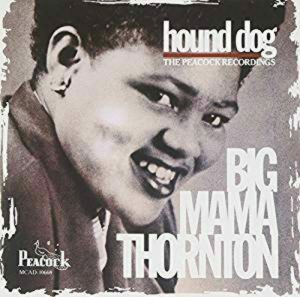 Willie Mae “Big Mama” Thornton (1926-1984) was the first vocalist to record Leiber & Stoller’s Hound Dog, later recorded and popularized by Elvis Presley. Her composition Ball And Chain, written in 1961, was later popularized by Janis Joplin on the Big Brother And The Holding Company album Cheap Thrills, released in 1967. BIg Mama Thornton was born in Ariton, Alabama. She began singing in church and began her professional performing career in 1940 with Sammy Green’s Hot Harlem Revue, where she was billed as The New Bessie Smith.” In 1951 she signed a recording contract with Peacock Records, for which she recorded the original version of Hound Dog. 1971 documentary about Muddy Waters featuring performances by Big Mama Thornton, Big Joe Turner and George “Harmonica” Smith.